We've made viewing side effects even easier - Logging on to the site now defaults you to our "Side Effects Hub", where you see all of our side effects listed, and can jump straight to individual ones to see tips and questions or post your own. Don't worry - the previous "Hub" is still there - it is now called the "Tip Center" and can be accessed from the top menu. We've made rating side effects even easier - simply click on the "Rate Side Effects" button on the top menu, which will launch a pop-up window. You can do this from anywhere on the site. We added a question about which side effect concerns you the most - this was done to better understand the patient experience, because we found out that while frequency and severity are important factors, there are other issues that impact side effects and quality of life as well that can lead patients to prioritize their side effects differently. There are more changes to come (we're always trying to make SideEQ even better), and we'll be sure to notify you as they happen! We'd love to know what you think of these changes - just send an email to contactus@mysideeq.org. Webcast - Energy, Nutrition, and Exercise! Are you a patient or caregiver who struggles with low energy, or is confused about how nutrition and exercise may be able to help you deal with your disease and its side effects? Some medical conditions mean that even when a person makes good diet and lifestyle choices, achieving good nutritional health and increasing energy remains challenging. 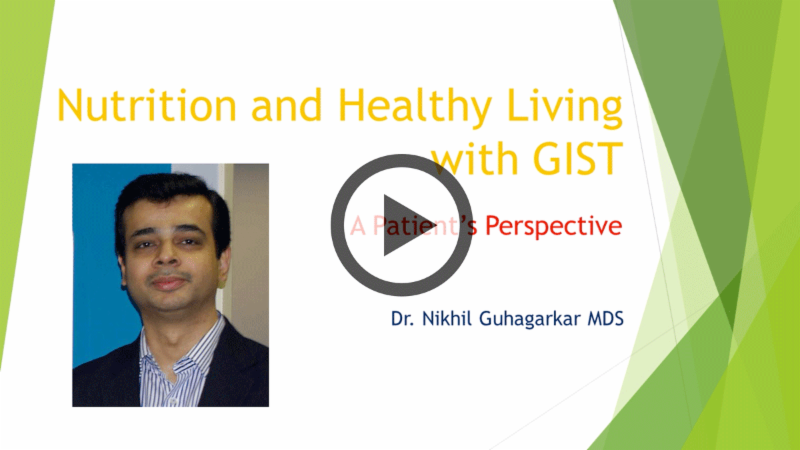 Listen now to an informative webcast from Dr. Nikhil Guhagarkar MDS, who will address this topic from a patient's perspective. Dr. Guhagarkar is an Oral and Maxillofacial Surgeon based in Mumbai, India, and is also a GIST (Gastrointestinal Stromal Tumor) patient. He has spent the last few years as a patient advocate, and has also authored the educational booklet "A Guide to Nutrition and Holistic way of Living with GIST". He will be discussing how to use a holistic approach that incorporates nutrition and exercise (including yoga and meditation) to achieve higher energy levels and help you live better with your disease. While Dr. Guhagarkar is a GIST patient, this webcast would benefit anyone who struggles with these issues, regardless of the disease they have. We believe that patients and caregivers sharing their experiences plays an important part in helping fellow patients achieve quality of life. After watching the webcast, join Nikhil and others to talk about nutrition and share tips on side effects management right here on SideEQ!!! Musculoskeletal pain after stopping imatinib affects about 25% of imatinib patients according to a recent study published in Leukemia Research Reports. View the full article here. Take Our Poll - Have your side effects gotten better over time?